In Hawaii, Aloha Friday is the day to take it easy and look forward to the weekend. So, following the tradition started by Kailani over at An Island Life, I thought that on Fridays I should also take it easy on posting. Instead I'm asking you a simple question and you can comment with your response. (Sorry I'm so late with this - Friday is almost over!) 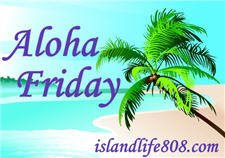 If you want to post your own Aloha Friday question, jump over to An Island Life and sign the Mr. Linky. Today's Question: What is your favorite healthy snack? Apple slices and peanut butter! I love fresh fruit especially off the tree in my backyard. fresh fruits or fruit juices.